On the sidewalk in the morning. Driven up from the river by the night’s rain. At dusk, I walk with my daughter. 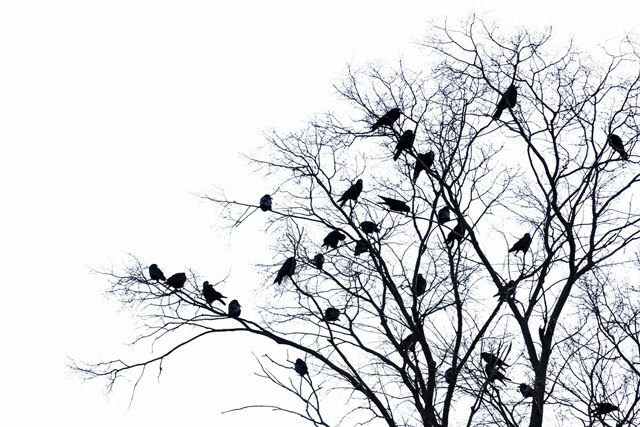 Caw, in a circle of branches. I spin around with my face to the sky. On the highest twigs of every tree. Onto the next circle of trees. The crows lead us home. Around our house, around our neighbors’ houses. Late at night, I look out the third floor window. Wedged among the leafless branches. Kathryn Hellerstein is Associate Professor of Yiddish at the University of Pennsylvania. Her books include a translation and study of Moyshe-Leyb Halpern’s poems, In New York: A Selection, (Jewish Publication Society, 1982), Paper Bridges: Selected Poems of Kadya Molodowsky (Wayne State University Press, 1999), Jewish American Literature: A Norton Anthology, of which she is co-editor (W. W. Norton, 2001). Her new book, A Question of Tradition: Women Poets in Yiddish, 1586-1987 (Stanford University Press, 2014), won the National Jewish Book Award in Women’s Studies. A major contributor to American Yiddish Poetry: A Bilingual Anthology (University of California Press, 1986), Hellerstein’s poems and many scholarly articles on Yiddish and Jewish American literature have appeared in journals and anthologies. She has received grants from the NEA, the NEH, and the Guggenheim Foundation. Her Women Yiddish Poets: An Anthology, is forthcoming from Stanford University Press.